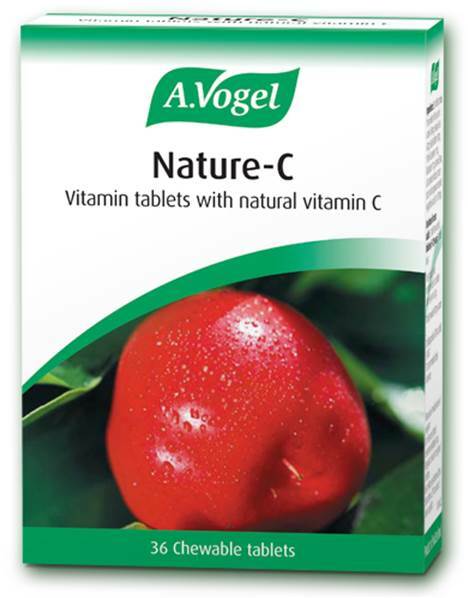 A Vogel Nature-C is a Health Supplement that benefits the immune system & helps the formation of collagen. Vitamin C from fruit and herbs. Alfred Vogel firmly believed that nature offered the best source of vitamin C. Nature-C contains a combination of extracts from a wide variety of fruits, all rich in naturally occurring vitamin C which is recognised by your body and is better absorbed. Each tablet contains the powdered dried juice of Acerola 480mg, Passionfruit60mg, Sea buckthorn 10mg, Prickly gooseberry 1mg, Blackcurrant 1mg,Lemon0.5mg. Also contains fructose, maize starch and magnesium stearate (vegetable source) to 1030mg.